(I totally know the song is let it “go”, this was just too good of an word play) I can’t even read the sign without breaking into song! I was going to put real chalk on the sign, but by making it matte white vinyl I have now worries about the weather on it! 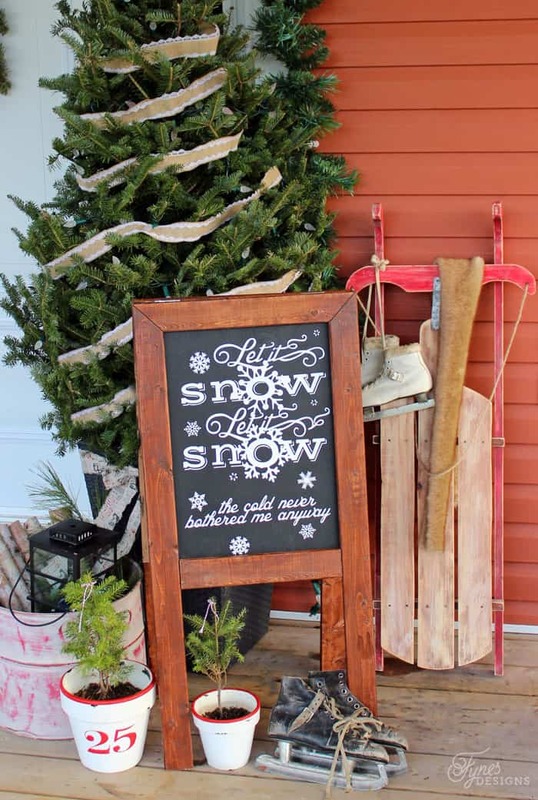 This cut file would be great for any Christmas sign, or even a card. There are SO MANY THINGS you can make with your Silhouette, it is by FAR my #1 crafting tool! If you don’t have one, run, don’t walk to the Shilhouette store, you’re husband won’t mind at all if you do! Don’t forget to use code FYNES to get these special deals! Well, wouldn’t I be tickled pink to win this fantastic prize! There are so many things I could do with this machine! Fingers crossed! Thanks so very much for a chance to win this wonderful prize! Fingers crossed that I win! I have been wanting a Silhouette for ages! Oh my this is really cute. Thanks for a chance to win. Fantastic cut file! Any chance you can post it in Legacy (.studio) format for those of us still not brave enough to use v3? Thanks!! I made a grapevine and burlap wreath. I would love to win your Silhouette Portrait! Thanks for the chance! Happy Thanksgiving to you!! Have a blessed one!! I’m making personalized Christmas Ornaments… beautifully with family names!! I used my Silhouette to cut out Christmas shapes to use as stencils to paint wooden gift tag ornaments. I’ve tackled a lot of Christmas crafting already but the biggest was putting up our 1st annual light show with my hubby & kids! 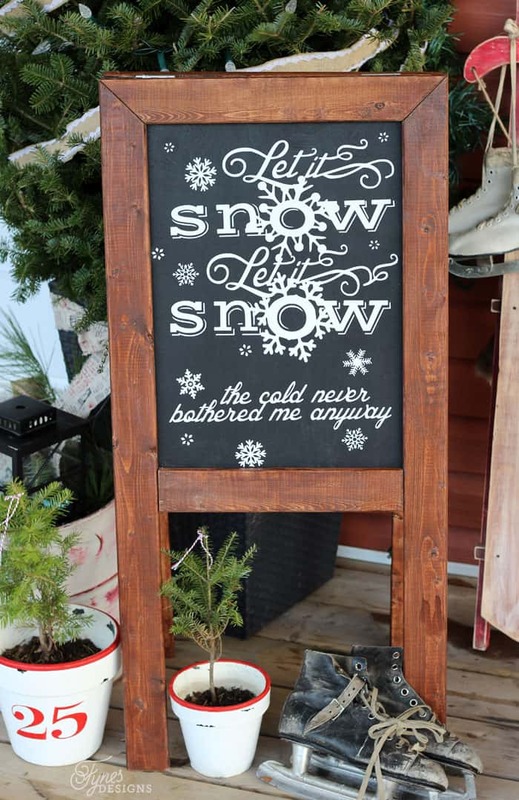 Pretty excited and would love to be able to cut out a saying & some snowflakes with a Silhouette! Wow there are so many things I could do with a Silhouette. Amazing give away, fingers crossed! Wow – what a great prize! Thanks for the chance to win! Lots and lots of food! I have a 6 kids and 21 grandkids which will all be here for the holidays! Lots of hungry tummies! Nutcracker season is almost over, so quilts and Christmas dresses are next on my to do list. I would love a new toy to play with! I’m making some homemade advent calendars! I just picked up fabric to make my kids Christmas blankets! I have made my own garland, have plans to make a coffee table scape (that’s a thing right? ), my man and I are going to make ornaments (TBD) and lots of other little things to decorate! I am using my Silhouette to make personalized cutting boards for the family! I would love this!! Vinyl cutting is my favorite and the cameo is definitely the machine to use. I would love cutting signs for friends for Christmas. Fingers crossed to win this awesome prize, thanks for the chance! I would love to be able to use this in my classroom, and with my scrapbooking and crafting projects!! Awesome, would love a chance to win! Currently working on a memory album for a family who lost a child to cancer. I’m making wreaths, ornaments and more! Love your project! I will be making ornaments this year for everyone!!! We’ll be making crafts with the grandkids! I love making things with them, especially at Christmas time! A TON of handmade ornaments! Wow! This would be an amazing prize to win! I will be making my tree skirt, a few wooden signs, possibly attempting to sew my own stockings. This year I’ve been working on some keepsake ornaments and the annual papercrafted calendar. i have wanted one of these forever! awesome giveaway! I have been eyeing the new cameo for a month now! I so want one for XMAS! I’ve been working on Christmas ornaments. If I win, I would be able to take a cutter to my shows to customize things for customers. YAY! I am making ornaments, wood signs, canvas signs, painted mason jars, and cards. This would help a ton! I would love to start doing all of the fun vinyl crafts and signs I see people doing…especially the ornaments and personalized goodies. Thanks for the awesome opportunity! I would love to win a Cameo!! I am now retired and have lots of time to play. thank you so much!! going to try some handmade ornaments for the tree this year! 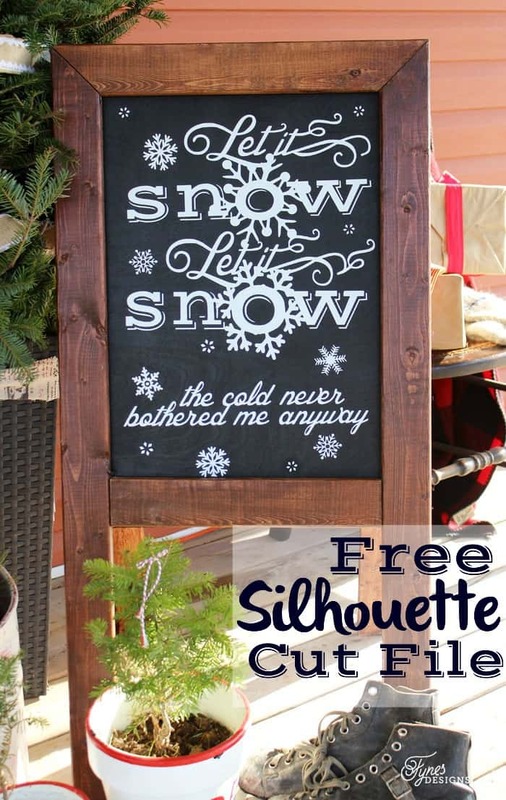 I see so many cool projects made using a Silhouette…I love to win! I’m making some Christmas tree ornaments (including crocheted snowflakes), and I may tackle a wreath, if I have time. I’m making tea light holders from mason jars, by painting nativity silhouettes on the outside of the jars… also soap and homemade body products. Wow! Thanks for the chance! I will be making sugar scrubs- possibly neck wraps too- and probably some ribbon-happy projects! Ornaments if I win. Thanks for the giveaway! 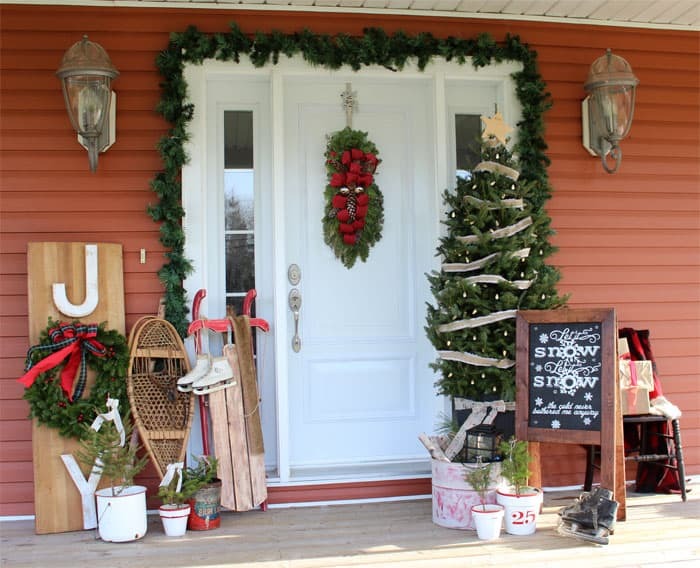 We get pretty crafty for the holidays. This year we will be making plenty of paper crafts and baking treats for our friends and family. I would love to try a silhouette! I have a bunch of Christmas craftbideas still up my sleeve! The possibilities are so endless with a Silhouette, I’m not sure where I’d begin. Probably making some onesies for my cute little godson! Table runner, handmade ornament …. thanks for a totally fabulous giveaway, friend! We are making Christmas ornaments with the kids, holiday banners, and some greeting cards. I would love to win, I could have a lot of fun playing with it. currently I am working on my brother in laws gift, a pallet board map and man, I could use a silhouette for the map part!! Making some snowglobes and picture frames! I am making Christmas shirts for all 7 of my grandchildren and great Grandson. Also some signs for each of them. Merry Christmas to all. I made a candy garland for a sweet inspired Christmas display in the kitchen. I love a trusty cutter with flexibility. So many options. Thanks for the chance to win a fab cutter. That is great to hear Shannon. Handmade garland is on my to-do list too! We have a new baby, so personalized ornaments are on my to-do list! Thanks Penny! Glad to have you on board! Thanks for the chance to win….love your blog! I made a wreath, and plan on making a sign. I’m knitting boot cuffs for my sister-in-law, which is currently my only homemade gift planned. I dont’ want to overcommit. I did make a driftwood star to top our tree too. The old silver metal one was way too heavy and wouldn’t stand up straight. This year I’m making a santa suit for my husband to wear and a dress-up dress for my niece. That is going to keep me busy enough in the crafting department! Handpainted wine glasses. Great giveaway! I will be making Christmas shirts for my niece and a few others! Thanks for the chance to enter! We are making ornaments for christmas and garland chains for our tree. I’ve left it too late to make Christmas gifts this year. 🙁 I’ll have to start soon after Christmas in order to get anything done in time for next year. Great giveaway! I will be making christmas shirt for my daughter. I’m not making anything for Christmas, but I am hoping to start my first quilt over the winter. Have an awesome day! I’m not making Christmas crafts this year. I am making snowman cards from my sons foot por the family. Thank you so much, Virginia. I’m done with Christmas crafts this year but I pinned it for next one, love it!! I really appreciate you shared it with us at #2usestuesday. Very cute.. Thanks for sharing with us at Throwback Thursday. Hope to see you again this week.